Feeling so great knowing your option goes to Concept2 which is great option by the way. But, not enough until that, you must be made a bit confuse about should you go for the Model D or Model E? Because, based on the information we got, Concept2 Model E is more expensive than Model D and most potential buyers feel confused, they think there are must be some unseen reason why those things happen between these 2 models. It’s never an easy decision to narrow down your choices when making a big-ticket purchase such as a rowing machine. It’s even more difficult when the two items are very similar. All in all we still have to see the review first before purchasing one product. 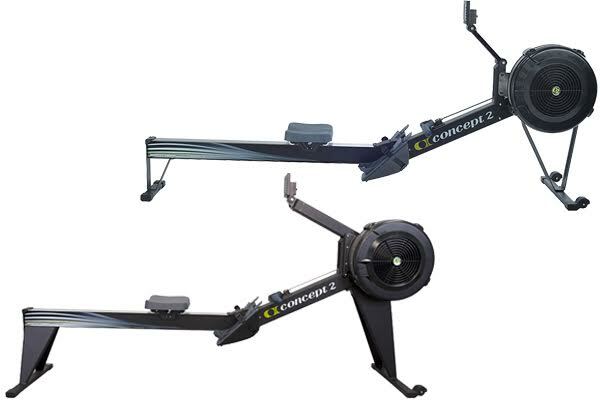 The Concept2 Model D is one of the most respected brands in the rowing industry. Concept2 Model D is usually being used in commercial gyms and boathouses by people of all fitness levels. But, people also can use it in their home because, it has a storage feature that partically cuts its working footprint in half and has attached wheels that make it easy to move. The monitor arm is made from ABS plastic, pivots for storage and to adjust monitor height. The legs are supported by Aluminium from legs and steel rear legs. The rowing motion mimics rowing outdoors on water and is as smooth as it gets. All of the features will allow you to adjust the feel of the rowing stroke by adjusting the amount of air that goes into the flywheel housing. Fully equipped with a top-notch performance monitor that not only track various fitness data but also tracks your heart rate, lets you play games, lets you upload your fitness data to an online logbook, and even teaches you how to row with proper form. The Concept2 Model E is 20 inch frame height and PM4 performance monitor accurately measures performances and heart rate. It is highly recommended tools for fitness, facilities and other high-use, multiple-user environments. With fixed monitor arm made of aluminium and monitor angle can be adjusted, The screen of Model E is completely fixed in place meaning the height and angle can not be changed and the additional height for improved accessibility and visibility, along with the extra ruggedness, all contribute to make the Model E the model of choice for these applications. The Model E also includes a more durable finish and one-piece steel legs for a more stable and solid feel than any other Concpet2 products. The legs also has been upgraded to the new materials from welded steel and the finish will be double powder coat with glossy finish. - 20-inch seat height, nickel-plated chain, adjustable footrests and ergonomic handle.